Wondering if flower farming is for you or in the first years of getting your business started? Want to learn how to grow flowers and manage the business while having a life too? Join Lisa for her Flower Farming School Online Course. Subscribe to Growing for Market newsletter. Is there any chance of a pick up point in west end Richmond or the Midlothian area? Hi Anne, our only pickup location is in Newport News, VA.
Lisa, thank you so much for all of your resources and insight. I am an aspiring urban flower farmer. This will be my first year to do this at all but I have big dreams. I am so thankful for all of your useful experience and information. Thank you so much for sharing! Well I believe that I have now read every word on your web site and watched your videos. 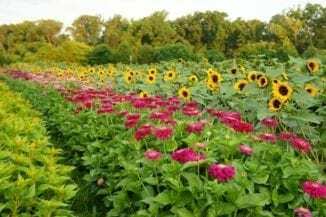 You are a fantastic resource for those of us growing flowers in the South. For several years I have been selling flowers and small arrangements at farmer’s markets. I had already read all of these books except Local Color. I have already ordered it. I have also joined the ASCFG and subscribed to Growing for Market. I am now trying to grow my business a little larger and reach out to some other markets. I am excited and scared to death! Thank you so very much for your advice and support! I am trying to rework my web site at this point. I will send the link when I get it updated.